We are excited to welcome new Editor-in-Chief Christopher Barner-Kowollik (Queensland University of Technology) to the Polymer Chemistry Editorial Board. Christopher Barner-Kowollik is Professor of Materials Science and head of the Soft Matter Materials Laboratory at the Queensland University of Technology. 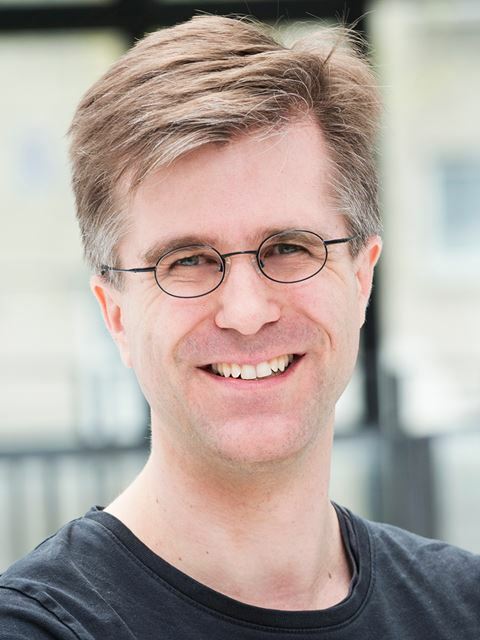 He has published over 510 peer-reviewed studies and won several awards for his research, most recently the coveted Erwin-Schrödinger Award of the Helmholtz association (2016) and a Laureate Fellowship from the Australian Research Council (2017). His main research interests are situated at the interface of organic, polymer and biochemistry and focus on a wide range of polymer-related research fields, such as the (photochemical) synthesis of complex macromolecular architectures with highly-defined functionality and composition, advanced synthesis via polymer ligation techniques and macromolecular transformations at ambient temperature in solution and on surfaces, with a strong focus on light-induced methodologies, advanced photolithographic processes, fundamental investigations into polymerization mechanisms and kinetics, as well as high resolution imaging and characterization of macromolecular chain structures via mass spectrometric methods in solution and on surfaces. Christopher has been an Associate Editor for Polymer Chemistry since 2009, and we are delighted that he has agreed to become our new Editor-in-Chief! Welcome to the new position! Christopher takes over from Professor David Haddleton, who has led the journal since its launch in 2009. We would like to thank Professor Haddleton for his excellent work as Editor-in-Chief and will be delighted to continue working with him as an Advisory Board member. 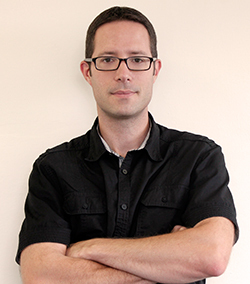 As Polymer Chemistry Editor-in-Chief, Christopher will be handling submissions to the journal. Why not submit your next paper to his Editorial Office? 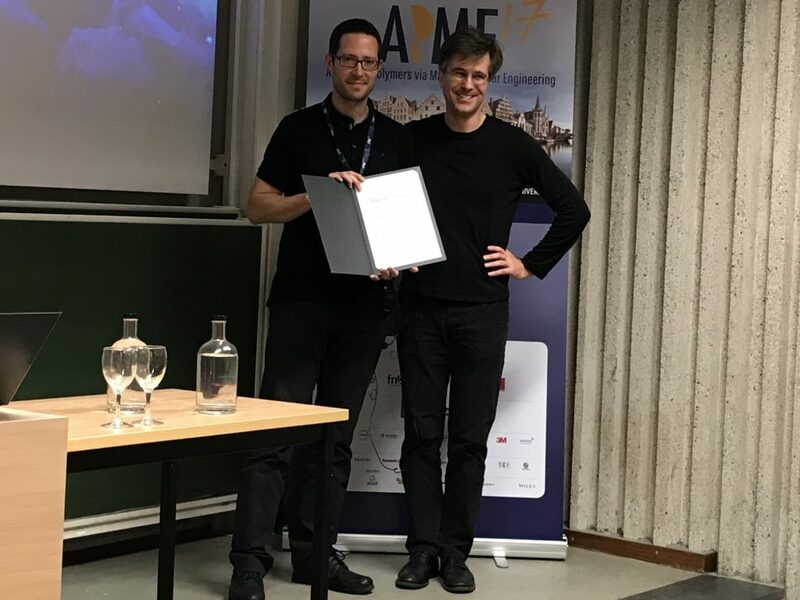 Dr Julien Nicolas (Université Paris Sud, France) was presented the 2017 Polymer Chemistry Lectureship award at APME 17 – Advanced Polymers via Macromolecular Engineering in Ghent. The prize was awarded by Polymer Chemistry Associate Editor Prof. Dr. Christopher Barner-Kowollik from Queensland University of Technology and Karlsruhe Institute of Technology. APME 2017 (Advanced Polymers via Macromolecular Engineering) took place in Ghent, Belgium on May 21-25, 2017. The focus of the APME2017 meeting was on macromolecular engineering for the design of advanced polymeric structures, in connection to their characterisation and recent applications. Congratulations to Julien on his award! It is with great pleasure that we announce Dr Julien Nicolas (Université Paris Sud, France) as the recipient of the 2017 Polymer Chemistry Lectureship. This award, now in its third year, honours an early-career researcher who has made significant contribution to the polymer chemistry field. The recipient is selected by the Polymer Chemistry Editorial Board from a list of candidates nominated by the community. Julien Nicolas obtained his Doctor of Philosophy in Chemistry and Physical Chemistry of Polymers in 2005 from the Laboratory of Polymer Chemistry, at the Université Pierre and Marie Curie, in Paris, France, under the supervision of Prof. Bernadette Charleux. He then joined Prof. David Haddleton’s group at the University of Warwick as a postdoctoral fellow in 2006. In 2007, he became a CNRS researcher at Institut Galien, Paris Sud, and became a Director of Research in the same institute in 2016. He has published more than 80 refereed scientific articles (h-index 36), filled 5 patents and is currently Associate Editor for Chemistry of Materials (ACS). Julien’s current research interests are multidisciplinary and span from organic chemistry and polymer synthesis to nanoparticulate systems and biomedical applications. The current interests of his group are focused on multifunctional biodegradable nanoparticles, well-defined molecular/polymer prodrug nanoparticles and controlled polymerization techniques from both fundamental and applied standpoints, with an emphasis on their application for the synthesis of biodegradable vinyl polymers and innovative biomaterials. Awards and honours he has received to date include the French Polymer Society (GFP) / French Chemical Society (SCF) award in 2016, and the 2017 Polymer Chemistry Lectureship award. Please join us in congratulating Julien on his award! UK researchers have shown that polymers can absorb chemical warfare agents. When dried, the densely crosslinked polystyrene networks can swell to accommodate organic molecules. They can therefore act not just as universal sorbents for soaking up a wide range of chemicals, but also as a new way to decontaminate stockpiles of chemical weapons. Read the full story by Hugh Cowley in Chemistry World. This article is free to access until 26 April 2017. 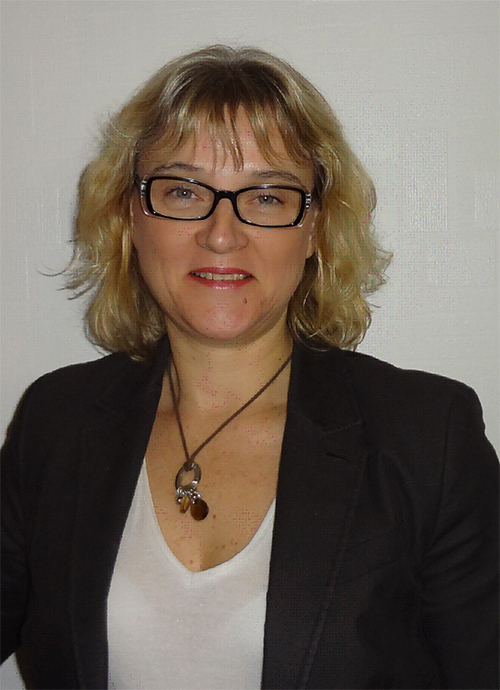 Sophie Guillaume is a member of the Advisory Board for Polymer Chemistry and a CNRS Research Director at the Institut des Sciences Chimiques de Rennes (ISCR), France. Her research focuses on the development of green pathways for the synthesis and structure–property relationships of synthetic polymers (especially polyesters, polycarbonates, polyolefins, and polyurethanes). Areas of emphasis include biobased degradable polymers and functionalized and reactive (co)polymers for advanced industrial and biomedical applications. You can find all Advisory Board’s Top Picks papers in our web collection. All articles are free to read until Sunday 5th March. Polyurethanes (PUs) are one of the most important classes of polymeric materials most widely used as coatings, adhesives, sealants, foams, or elastomers. These multiblock copolymers are formed by the stepwise addition of diols (or polyols) with diisocyanates (or polyisocyanates). Efforts to reduce their environmental impact and to improve their sustainability, resulted in the development of biobased monomers, and of greener processes towards non-isocyanate polyurethanes (NIPUs). Original PU materials with properties at least matching or improving those of the current PU market are thus being sought. To this end, functionalization introduced via the amine segment, the polyol moiety, or the repeating units’ pending groups, is a key parameter to tune towards the desirable characteristics and targeted applications. The biomedical field provides further opportunities for biocompatible and biodegradable PU materials which are widely used as nerve tissue scaffolds, vascular prostheses or drug delivery systems. However, their physical properties (mechanical properties, degradation performances and blood compatibility) still require improvements. These present trends are illustrated with the following top-picks. Current efforts in the polyurethane (PU) community aim at developing green strategies exempt of the use of toxic and dangerous isocyanates. Nowadays, the most promising route towards such non-isocyanate polyurethanes (NIPUs) is the aminolysis of dicyclic carbonates. H. Sardon and co-workers at the University of the Basque Country (Spain), have synthesized, at room temperature without the need for any additional catalyst, high molar mass NIPUs (up to 47 kg.mol1) from a (bis) N-substituted eight-membered cyclic carbonate (N-8CC) derived from renewable resources using a variety of diamines. These experimental results highlight the unique reactivity of this N-8CC over the smaller five- and six-membered cyclic carbonates, as further supported by computational insights which revealed a kinetically and theoretically more favourable ring opening of the N-8CC by an amine system. Poly(hydroxyurethane)s (PHUs) derived from the polyaddition of six-membered ring cyclic carbonates with diamines are promising non-isocyanate polyurethanes (NIPUs) alternatives to polyurethanes (PUs), as evidenced by T. Endo and co-worker at Kinki University (Japan). Such PHUs advantageously contain two primary hydroxyl groups in their side chains of repeating units, which improve the hydrophilicity and which can be chemically modified to design functional PHU materials. Original well-defined water-soluble poly(carbonate–hydroxyurethane)s comprising hydroxyurethane–carbonate–hydroxyurethane alternate structures were synthesized from trimethylolpropane and conventional diamines. Investigations of their hydrolytic properties in aqueous media at different pH values revealed their complete decomposition to their basic structures in carbonate buffers at pH 10.6 within one week. A series of linear and cross-linked polyurethanes (PUs) is reported by E. Chen and co-workers at Colorado State University (USA), from the catalysed polyadditions of diol, triol or tetraol derived from the biomass platform chemical 5-hydroxymethylfurfural (HMF) – one of the most value-added biomass building blocks or platform chemicals – with various diisocyanates in the presence of a catalyst (organocatalyst or dibutyltin dilaurate), respectively. The PU materials derived from the new diol monomer, namely 5,5’-bihydroxymethyl furil, and aromatic diisocyanates such as diphenylmethane diisocyanate, revealed valuable characteristics (Mn,SEC = ca. 40 kg mol−1, onset decomposition temperature = 234 °C, and Tg = 140 °C). Solvent casting from these PUs affords thin films ranging from brittle to flexible with a high strain at break of 300%. The synthesis of a new epoxy thiolactone is described by H. Keul and M. Möller and co-workers at RWTH Aachen University (Germany), along with its ability to act in several concepts as a versatile tool towards polymeric materials. The reactivity of this epoxy thiolactone with an amine and catalytic amounts of a base, results in the selective ring opening of the thiolactone to generate an AB-type epoxy thiol monomer, which in situ starts a thiol-epoxy polymerization to ultimately form poly(thioether urethane)s (PTEUs). Besides the introduction of a new functionality – the organic residue – by the amine used for ring opening of the thiolactone, the PTEU backbone further exhibits a hydroxyl functionality. The latter increases the hydrophilicity of the polymer backbone and also provides a site for an additional functionalization. Two strategies were elaborated for the generation of functional gels from this epoxy thiolactone bis cyclic monomer, using a diamine or a triacrylate. These one pot processes are feasible and provide an interesting platform for a variety of polymer architectures hosting functionalities. A novel block polyurethane (PU) based on poly(3-hydroxybutyrate-co-3-hydroxyvalerate) (PHBV), 4,4’-diphenylmethanediisocyanate and poly(ethylene glycol) (PEG) was synthesized by Zheng and co-workers at the University of Science and Technology Beijing (China), from the polyaddition of PHBV diol with ,-diisocyanate telechelic PEG. The resulting PU films exhibited biodegradability at 37 °C in phosphate buffer solution (PBS) at pH 7.4, non-cytotoxicity towards the growth and proliferation of the bone marrow mesenchymal stem cells, and hemocompatibility. The degradation rate results indicate that PHBV-based PUs are more suitable for biomedical applications requiring a longer degradation period. Greater PHBV contents also favourably influenced the mechanical properties and the thermal stability of these PU films. These new PHBV based PU materials with better mechanical properties, biodegradability, hemocompatibility and biocompatibility, may find potential applications in blood vessel tissue engineering. A multi-functional polyurethane (PU) with both a thermo-induced triple shape memory effect and a pH-sensitive dual shape memory effect has been developed by Chen and Hu and co-workers at Sichuan Normal University (China). The two-step polyaddition of polyethylene glycol (PEG), and 4,4’-diphenylmethane diisocyanate, followed by polymerization of the resulting diisocyanate end-functionalized PEG with dimethylolpropionic acid afforded the desired PUs bearing pendant carboxyl groups. In PU with 30wt% of PEG, the glass transition of PEG chains and the association/disassociation of carboxylic dimers act as two switches to control the triple-shape memory effect, while the carboxylic dimer is affected by pH values to associate in acidic solutions (pH 2) and dissociate in alkaline solutions (pH 9) to induce the pH-sensitive shape memory. The carboxylic dimers play an important role in the construction of shape memory properties in these PUs. Indeed, PUs with too high or too low carboxylic content (e.g. with 20 or 40wt% of PEG) did not exhibit any shape memory properties. We are delighted to announce that the Advanced Polymers via Macromolecular Engineering (APME 2017) conference will be held in Ghent, Belgium on 21 – 25 May 2017. The 12th International Conference on “Advanced Polymers via Macromolecular Engineering” (APME 2017) will be hosted by the Centre of Macromolecular Chemistry (CMaC) at Ghent University, Belgium on 21 – 25 May 2017. APME 2017 will continue the tradition of successful polymer meetings, after the previous conference held in Yokohama in 2015. The APME2017 meeting will focus on macromolecular engineering for the design of advanced polymeric structures, relating to their characterisation and recent applications. The meeting will be excellent platform for macromolecular engineers and scientists to present their research and exchange ideas through fruitful discussions, in the beautiful city of Ghent. After the last plenary lecture on 24 May 2017, a football game is announced, opposing the “Belgian polymer team” and the “Rest of the World polymer team”. Registration deadline is 15 Januray 2017 – only a few days left, don’t delay! We are delighted to announce that the International Conference on Material Science (ICMS2017) will be held in Agartala, India, on 16 – 18 February 2017. The first International Conference on Material Science (ICMS2013) was successfully organized by the Department of Physics, Tripura University, on 21-23 February, 2013. The conference received praise for its quality, with one keynote lecture, fourteen invited talks and 176 presentations. The Department of Physics, Tripura University (A Central University), is organising the Second International Conference on Materials Science (ICMS2017) on 16 – 18 February, 2017. The conference aims to provide a forum for scientists, researchers and educators around the world to discuss about state-of-the-art research and development, and identify research needs and opportunities in all aspects of Material Science. The primary objectives of this conference are to provide scientists, engineers, graduate students and other professionals with an interactive forum to exchange viewpoints, debate science, and create opportunities for the next generation of scientists to develop their professional skills. Standard registration deadline is 10 February 2017 – don’t delay! The Royal Society of Chemistry proudly sponsors this event by delivering a poster prize. Most current plastics are made from oil, which is unsustainable. Due to dwindling fossil fuel supply and growing environmental concerns, the demand for renewable and green plastics has intensified. Thus, scientists from the Centre for Sustainable Chemical Technologies (CSCT) at the University of Bath have developed a renewable plastic from pinene, a naturally-occurring chemical species found in pine needles. According to Professor Davidson, this would open the way to making new polymers from a renewable source, independent from petrochemicals. The outcomes could be very intense for the environment, and could revolutionise the chemical industry. Some of the most common bio-derived monomers are α- and β-pinene (from gum turpentine) and D-limonene (from citrus waste), as well as isoprene. The authors believe that the abundance of double bonds in these molecules would allow for efficient cationic and radical polymerisation reactions, as well as epoxidation as a route to biodegradable oxygenated polymers. Read the full story on the University of Bath website. 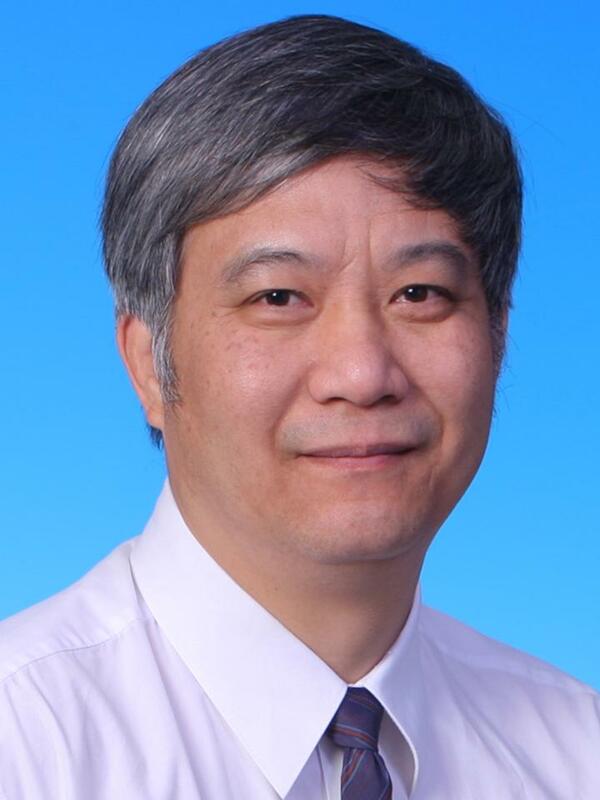 Ben Zhong Tang is a member of Advisory Board for Polymer Chemistry and K. C. Cheong Professor of Science and Chair Professor of Chemistry and Biomedical Engineering at The Hong Kong University of Science and Technology (HKUST). His research interests include macromolecular chemistry, materials science, and biomedical theranostics. Tang’s research group has been working on the development of new polymerization routes from alkyne reactions, and has succeeded in the syntheses of a number of new functional conjugated polymers from acetylenic monomers. Professor Tang has published over 900 papers which have been cited more than 40,000 times, leading to an h-index of 101. He has been listed by Thomson Reuters as a Highly Cited Researcher in both areas of Chemistry and Materials Science. He received a Natural Science Award from the Chinese Government and a Senior Research Fellowship from the Croucher Foundation in 2007. All articles are free to read until Sunday 22nd January. Polym. Chem., 2016, 7, 5943–5948. K. O’Reilly and collaborators at the University of Warwick (UK), Australian Synchrotron (Australia) and BP Exploration Operating Company, Ltd. (UK) synthesized fluorescent CO2-responsive cross-linked polymeric particles via emulsion polymerization. In this system, a fluorescent monomer (aminobromomaleimide with high quantum yield was used as a probe for the core hydrophobicity; Poly(N,N-diethylaminoethylmethacrylate) and oligo(ethyleneglycol methacrylate) were utilized as the CO2-responsive core-forming segment and the hydrophilic shell-forming block, respectively. The polymer particles became swollen and the corresponding fluorescence intensity drastically decreased through simple CO2 bubbling. This contributed to the increased hydrophilicity of the particles. In addition, the swelling and emission processes were reversible by purging the mixture with nitrogen. The researchers also found that the ON/OFF cycles of fluorescence could be reproducible with CO2/N2 purges, indicating that the polymer can be used as a fluorescent sensor for CO2 detection. Polym. Chem., 2016, 7, 6895–6900. In this work, P. De and coworkers at Indian Institute of Science Education and Research Kolkata synthesized a group of dual pH- and thermo-responsive fluorescent copolymers with a poly(maleimide-alt-styrene) skeleton that is free of traditional fluorophores. The emission intensity of the copolymers increases with increasing pH and decreases with increasing temperature from 20 to 70 °C at pH 4.5. Density functional theory calculations show that the π molecular orbital is located over the benzene ring as the HOMO and the π* on the maleimide unit as the LUMO, suggesting that the through-space π–π interaction between the benzene ring and the neighboring carbonyl group of the maleimide unit is the origin of the unexpected fluorescence in the copolymers. Polym. Chem. 2016, 7, 3747–3755. Fluorescent polymers containing no aromatic rings have attracted much interest due to their environmental benignancy, cytocompatibility and biodegradability. S. Niu, H. Yan and coworkers at Northwestern Polytechnical University (China) designed and prepared new hyperbranched polysiloxanes by a one-pot transesterification reaction of excessive neopentyl glycol with triethoxyvinylsilane. The resultant non-conjugated polysiloxanes show bright blue photoluminescence. Their emission intensities are increased when the polymers are more aggregated by increasing their molecular weights and concentrations, showing the photophysical effect similar to aggregation-induced emission. The interaction between the unconjugated C=C and –OH units in the tight aggregate was proposed to be critical for such strong unconventional luminescence. Polym. Chem., 2016, 7, 6178-6188. Supramolecular brush copolymers (SBPs) fabricated from simple building blocks via non-covalent interaction have tremendous advantages, such as stimuli-responsiveness. X. Chen, F. Huang and coworkers at Zhejiang University (China) and National Institutes of Health (USA) constructed SBP-based supramolecular nanoparticles (SNPs), which were utilized as a self-imaging drug delivery vehicle by taking advantage of the photophysical effect of aggregation-induced emission. The fluorescence arising from tetraphenylethene and doxorubicin (DOX) was quenched due to the involved energy transfer relay effect. The silenced fluorescence was recovered at low pH and by reductase through the release of the loaded DOX, achieving in situ visualization of the drug release process. In vitro and in vivo experiments confirmed that the DOX-loaded SNPs showed excellent antitumor efficacy with negligible systemic toxicity. The present study provides a novel supramolecular method for the construction of self-imaging drug delivery systems, with promising applications in the field of cancer treatment. In this work, X. Ma, H. Tian and coworkers at the East China University of Science and Technology developed a new system of room temperature phosphorescence (RTP). The system was constructed from γ-cyclodextrin (γ-CD) and a polymer containing 4-bromo-1,8-naphthalic anhydride moiety (poly-BrNpA). While the aqueous solution of poly-BrNpA alone does not give any RTP signal, the poly-BrNpA/γ-CD binary system shows RTP emission centered at 580 nm with a lifetime of 0.32 ms. NMR spectroscopy was used to study the complexation behavior and to prove that the RTP of poly-BrNpA/γ-CD is from the host-guest interaction between poly-BrNpA and γ-CD. From poly-BrNpA/γ-CD, a pure organic RTP hydrogel was successfully prepared. Through incorporating azobenzene (Azo) unit, the RTP of the ternary mixture of poly-BrNpA/γ-CD/poly-Azo becomes reversibly tunable by the photo-isomerization of the Azo unit. This photo-regulation is achieved by the inclusion competition between the cis/trans isomers of the Azo unit and poly-BrNpA. An optically active π-conjugated polymer containing chiral glucose-linked biphenyl units can interconvert between random-coil and helical-chain conformations in response to external environment, as demonstrated by T. Ikai et al. at Kanazawa University (Japan). The optically active polymer likely folds into a helical structure with a preferred handedness in the suspension containing high amounts of a poor solvent (acetonitrile), whereas the polymer conformation becomes a random coil in pure good solvent (chloroform). In addition, the chiral helical polymer shows efficient left-handed circularly polarized luminescence (CPL) with a green color. The solvent-dependent CPL signal change was also observed. The dissymmetry factor of the chiral helical polymer can reach 1.9×10-2 in the film state. The researchers thus offer a new approach to functional materials through utilization of the chirality of abundant biomass resources. The 2017 Global Conference on Polymer and Composite Materials (PCM 2017) will be held in the beautiful city of Guangzhou, China. This well-established conference series is dedicated to cover all theoretical and experimental aspects of polymers and composite materials. Building on the hugely successful preceding Conferences (PCM 2014 in Ningbo, PCM 2015 in Beijing, and PCM2016 in Hangzhou), PCM 2017 will provide an ideal academic platform for researchers to present their latest findings, and to facilitate networking and in-depth discussion with peers from Asia, Europe and USA. The scientific program will focus not only on current advances in the research, but also in the production and use of polymers and composite materials in different fields. The conference setting has a highly focused technical program through plenary, invited, oral and poster presentations.